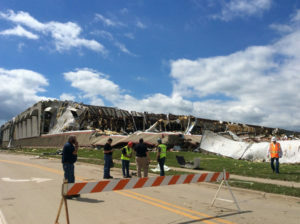 National Weather Service photo of Lennox Industries tornado damage in Marshalltown. Lennox Industries will rebuild in Marshalltown. The factory which produces heating and cooling equipment was heavily damaged by last week’s tornado. Marshalltown Mayor Joel Greer made the announcement at last night’s city council meeting. “They’re willing to rebuild and just think of the kind of money it’s going to take to get that plant back in operation,” Greer said. The major suggested it could take $100 million to replace the Lennox factory, which is one of Marshalltown’s largest employers. Greer said the company’s decisions will have ripple effects through the community. “To be telling their contractor to be buying supplies from the local people who have the supplies and using the local labor, including their own employees,” Greer said. Greer and the governor met with the company’s executives Monday afternoon to discuss the company’s plans. Lennox Industries was founded in Marshalltown in 1895. About 1400 people were employed at the facility when the tornado hit.